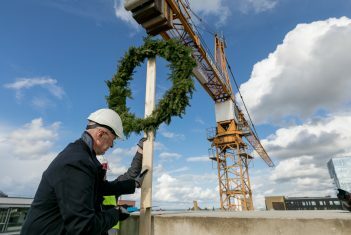 Today the topping out rite took place in the hall complex, the construction of which will be finished next autumn by the 100th anniversary of the Estonian Academy of Music and Theater. The building has now reached its full planned height of 23.6 meters and thus the important stage of the construction works was successfully completed. Today in the afternoon, in the presence of the Minister of Education and Science Mailis Reps and the Minister of Culture Indrek Saar, the rector of the Estonian Academy of Music and Theater Professor Ivari Ilja officially removed the garland from the roof of the new top-class building of the hall complex. Traditionally, the person who orders the building must remove the garland from the roof and organize for food and drinks for the builders to ensure good luck for the future building. Otherwise, the builders first replace the garland with an old broomstick, and then with worn work pants – as the result, the building will quickly collapse. To avoid this, yesterday a traditional topping out rite was organized for the builders. The Minister of Education and Science Mailis Reps noted that the topping out rite is a step towards EAMT celebrating its centenary in the new building with a concert hall featuring excellent acoustics and modern technologies, blackbox rooms and classrooms. “I wish the entire family of the academy just a little more patience, and also to practice a lot to be able to fill the new hall with wonderful sounds and unforgettable performances,” Reps said. “We should always remember that the most unique thing that we can offer the world is our culture. We ourselves go to concerts and the theater more often with every passing year. Construction of this new learning environment is thus natural and necessary. In addition, the organizers of cultural events will receive a complex with modern facilities, where it will be possible to present the most innovative achievements for which we simply did not have a suitable place before. In a word, this is a worthy gift for the anniversary of our culture state,” the Minister of Culture Indrek Saar said. According to the rector of the EAMT Professor Ivari Ilja, the purpose of today’s topping out rite is to express gratitude to the builders and to establish warm relationships with the spirit of the house. “There are plenty of reasons to thank the builders, since the work is well ahead of schedule. Everything indicates that by the anniversary of EAMT in September 2019 we will be able to open the long-awaited hall complex, which, along with a place for study work, will often serve as a venue for concerts and performances,” said Professor Ilja. The central part of the complex with the total area of ​​6,100 square meters will be occupied by a concert hall with 480 seats built over four floors and ideally suited primarily for the performance of classical music, but also works of other styles. The blackbox for 130 spectators will be built over three floors – it will be used by students of theatrical art and jazz musicians. The five-story building with a ground floor will also accommodate 21 classrooms, including a multimedia studio and a jazz classroom. All floors of the hall complex will be connected to the main Academy building located nearby. The Administrative Director of EAMT Ott Maaten noted that today an important intermediate stage of the construction of the hall complex has been successfully completed. “The main construction elements of the building are essentially ready. The facade is almost finished, and the doors and windows are installed. Interior finishing works may commence,” explained Maaten. The EAMT hall complex is designed by AS Resand. The architects of the building are Toivo Tammik and Mart Rõuk from Ansambel bureau. The interior architecture of the halls is designed by Aivar Oja from FraDisain OÜ. The acoustic project is prepared by Linda Madalik in collaboration with the Danish acoustic bureau Gade&Mortensen Akustik. The building is built by Nordlin Ehitus AS, the owner’s supervision carried out by Tallinna Linnaehituse AS. The construction of the complex is financed by Eesti Kultuurkapital, the Regional Development Fund of the European Union and EAMT.